So last week Wednesday one of my best friends Gemma arrived in New York for a one-week visit. We're pretty much on the same page when it comes to traveling, so every time we get together we use every single minute of the day, we don't stop. We did so much in one week, walked more than 20 kilometers every day, went to some of my favorite places and discovered many new ones. I promised Gemma to make a Google Map with everything we did, and since I think it's a pretty good map I decided to share it with you too. It's by no means a complete guide of New York, but it's a pretty good local's guide as my friend described it, and might inspire you for your next trip to New York! • Banter - Australian breakfast and brunch spot. Take the avocado toast and sweet potato fries. • Café Henrie - Cute millennial pink breakfast spot. Order the açaí bowl and the avocado toast. • Pepe Rosso To Go - Take-away pasta. Simple, cheap and tasty. • Two Hands Cafe - Australian brunch spot, longer wait during weekends, quiet on weekdays. • Jack's Wife Freda - Classic New York breakfast/brunch spot. Go to the quieter location at Carmine St and order the rosewater waffles, dreamy. • La Colombe Coffee Roasters - Simple takeaway coffee place where they make some of the best almond flat whites in town. • Gemma - Italian restaurant part of the Bowery Hotel. Walk-ins only. Order the truffle pizza with robiola cheese. • Chobani SoHo - Simple little breakfast spot where they serve all kinds of yogurts. Quick, cheap and delicious. • The Plaza Food Hall - Fancy food hall with different popular food spots collected in one place, like the Doughnuttery and Lady M cakes. • Yours Truly - One of the only coffee spots in NY where they have Oatly oat milk, the very best milk for iced lattes. If I'm honest Happy Bones has similar quality coffee but you get more for the same price and they also serve Oatly. • Cha Cha Matcha - Popular, pink, palm trees and matcha tea/ice cream. Slightly overhyped but cute. • Mamoun's - Falafel pita: the best 3 dollars you'll spend in New York and also some of the best falafel I've tried. • Charlie Bird - One of my favorite restaurants in all of New York. Modern Italian food. Everything is delicious, but the farro salad is to die for. I could eat it every day. • Pasquale Jones - Charlie Bird's sister restaurant, serving mostly pizza. Not your average pizza, but a more special take on the Italian classics. Take a seat at the bar and watch the chefs make the pizza, it's the best spot in the restaurant. • Sweetgreen - Take-away salads. Make your own or choose one from the menu. My favorite healthy takeaway meal. • Morgenstern's Finest Ice Cream - The finest ice cream in New York, and worth the wait. Try some flavors and find your favorite. I love the peanut butter, the salted chocolate, and coconut ash. • J.G. Melon - Gigi Hadid's favorite hamburgers. Simple, cheap and pretty good. Perfect before a night out. • Baita at Eataly - The food and service were pretty terrible, but the rooftop is nice so just go for drinks at the bar instead. Real summer vibes! • Five Leaves - Probably the best pancakes in New York. Actually, everything is delicious here. Worth going to Brooklyn for. • Sauvage - Plan B if the wait at Five Leaves is too long. Very pretty Cuban-inspired interior and tasty brunch food. • Clover Grocery - Brand new grocery/deli on 6th avenue, part of Café Clover. Find some special food products here or get a coffee/smoothie at the counter in the back. • Lovely Day - Cheap Thai food in a cozy environment. Find a table downstair and order a spicy curry (not for the faint-hearted). • Pause Cafe - The tastiest & prettiest açaí bowls in the city. The place is absolutely tiny so go early or do takeaway. • Sweets by CHLOE. - The bakery right next to By CHLOE on Bleecker Street. All kinds of vegan sweets and drinks. • Toby's Estate Coffee - Amazing location, right in front of a bookstore/flower shop. Take a cortado and browse through some books. • Greecologies - Homemade Greek yogurt, wifi and a hidden garden in the back. What's not to love? • Paul’s Casablanca: Currently my favorite club. Super fun music, nice crowd and always a good time. • Paul's Cocktail Lounge: AKA Paul's Baby Grand. Pretty interior (including palm tree wallpaper and velvet pink couches) and 80's music. • SPiN New York: A clubby ping pong place. Super fun and a different kind of night out. • Jimmy at The James Hotel: Cool rooftop bar with a view on Tribeca. Perfect for a sundowner. • The Black Lodge: One of New York's newest clubs. Very small and intimate but always a good time. • Mother's Ruin: A nice bar to grab a drink after dinner or before going out. They also serve snacks. • Bar SixtyFive at Rainbow Room: Don't come for the bar, but come for the view. One floor below "Top of the Rock" minus the ticket price. Breathtaking views of the city. I won't further elaborate on the shops, they kind of speak for themselves. The ones I'd highly recommend are Fivestory (you'll want it all), Ulla Johnson (the prettiest store you'll ever see), Club Monaco on 5th Ave, Barneys (heaven), Bandier, Prada SoHo (with skate park inside, so cool), Glossier, Mansur Gavriel and Catbird. • Solomon R. Guggenheim Museum - One of my favorites and also one of the coolest buildings in NY. • Whitney Museum - Right by the High Line, amazing views of the city and interesting contemporary art. • The Earth Room - One of Walter De Maria's "hidden" artworks in SoHo. Free entrance. • The Broken Kilometer - Another One of Walter De Maria's "hidden" artworks in SoHo. Free entrance. • Neue Galerie New York - Currently showing Klimt works. • Cadillac House - Right now there's one about IBM's Watson. There's also a coffee bar, wifi and very comfy couches. Most of these landmarks are very well-known so I won't elaborate. 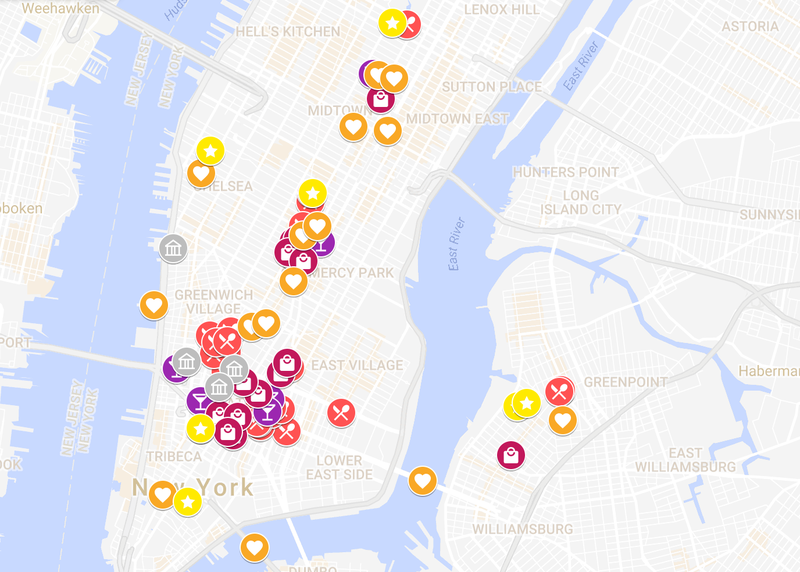 Some of them can be very touristy (try to see them in the morning or on weekdays), others are more "local" (like Washington Mews, Williamsburg Bridge and Pier 45). I'm still making my actual New York City Guide with all the places I went to in this city, but I will only post that one in July probably. If you want a sneak peek, here it is ;) And I hope the map in this post serves as a good temporary guide. This gives you an idea of the amount of things you could do and see during one week in New York. It's a lot right? I really love a lot of these places and we had an amazing week so I hope you will too!